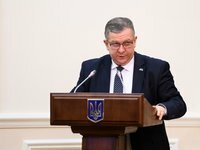 Nearly 1.9 million pensioners in Ukraine will receive an extra payment of UAH 2,410 in March and April, Social Policy Minister Andriy Reva has said. "We are talking about people who have a basic pension below the subsistence level ... Of these, almost 1.9 million pensioners have a full insurance record ... An extra special payment of UAH 2,410 will be made to them, it will be paid twice: in March and April," Reva said, making a report on the upcoming readjustment of pensions at a government meeting. "Where did this figure come from? If we take their basic pension, namely, UAH 1,497, and multiply by the consumer price increase index for two years, when their pensions were actually frozen, the figure will be UAH 2,410," he said. As reported, pension payments in Ukraine from March 1, 2019 will be raised by an average of UAH 255 as a result of readjustment. Pension readjustment will concern 8.1 million pensioners.